By mobilizing a network of non-profit organizations and attorneys, F.I.R.E. 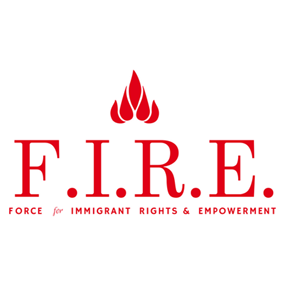 (The Force for Immigrants’ Rights and Empowerment), strive to provide coordinated assistance for people as they navigate the U.S. immigration system and continue to build their lives as members of American society. Members and Partners of F.I.R.E. work together to improve access to resources by facilitating connections between immigrant communities and local social and legal services, to streamline and standardize coherent and consistent messages about immigrants’ rights by sharing information internally and externally regarding the latest changes in immigration-related law and policy, and to facilitate communication and coordination of events to ensure that immigrant communities understand their rights and the resources available to them. F.I.R.E.’s membership currently includes ACLU of Texas, CAIR-DFW, Catholic Charities of Dallas, Cheryl Pollman, Dallas County Public Defender’s Office, Dallas Peace & Justice Center, Equal Justice Center, Human Rights Initiative of North Texas, Hunter Legal Center for Victims of Crimes Against Women at SMU Dedman School of Law, Justice for Our Neighbors DFW, Light of Hope Immigration Law Center, Mariela Nuñes-Janes, Mosaic Family Services, North Texas Dream Team, Proyecto Immigrante ICS, Inc., RAICES, Refugee Support Network, Texas Organizing Project, and Workers Defense Project.